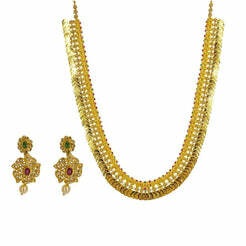 22K Yellow Gold Antique Bridal Set W/ Kundan & Double Row Ornate Collar Necklace for women. 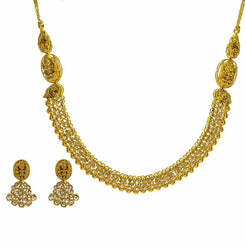 Make your special day even more memorable with this unique antique bridal set adorned with Kundan and two rows of of round ornate accents set on a collar necklace. 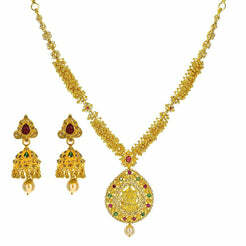 The necklace is 16" long with a wide range of 2-35 mmw ide. Its pendant is 10 mm long and 8 mm wide. Each earring is 2.1" long and 16 mm wide. This antique bridal set weighs a total of 78.4 grams.